The Sierra M6-1 products are ultra-portable single-port systems. Measuring just 6.25" wide, 1.38" high, 9.0" deep (15.9 x 3.5 x 22.9 cm) and weighing in at 1.7 lbs (0.77 Kg), Sierra M6-1 systems are incredibly compact units fitting easily into the corner of a brief case or backpack. Operating at 1.5, 3, or 6 Gb/s SATA data rates, and available with 2 or 4 GB of recording memory, Sierra M6-1 systems offer world-class protocol verification capability at price points within reach of every budget. Sierra M6-1 systems come standard with both USB and GbE interface ports for maximum flexibility in connecting to the PC used to host Teledyne LeCroy's SAS/SATA Protocol Suite software. The versatile GbE port can be used for either local or remote network connectivity. Sierra M6-1 systems can be linked together in cascade configurations to provide additional recording channel capacity, enabling simultaneous error injection and trace capture/analysis (requires multiple Sierra M6-1 units, at least one licensed as a protocol analyzer model and one licensed as an error injector). The Sierra M6-1 data capture capabilities include Easy Mode triggering to provide engineers with the ability to capture precise traffic conditions such as timing between events or changes in link state. Easy Mode triggering conditions can be set up quickly through very straightforward, easily understood drop-down menu selections. The Sierra M6-1 incorporates 6 Gb/s capable native PHYs for better capture performance in speed negotiation and power management phases. Sierra M6-1 products are designed for convenience, portability, and functionality. The front panel provides convenient access to Host and Device data bus connectors and 5 status indicator LEDs for each connectors (Trigger, Error, Link, Speed, Data). The Sierra M6-1 rear panel provides a multifunction connector for External Trigger IN/OUT and SYNC Expansion Port; USB 2.0; 10/100/1000baseT Ethernet; and DC power in connections. Sierra M6-1 also features a Packet View specifically designed for the application layer. Frames and primitives that are logically part of a specific SATA command are assembled for quick and easy review. The Packet View is protocol specific and allows users to quickly view command definitions, completion, and status. 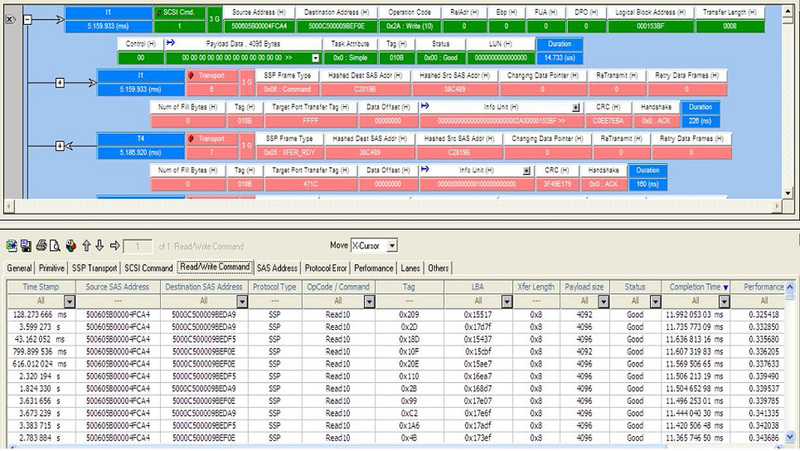 The capabilities of the SATA Protocol Suite software are especially useful in addressing system-level debug challenges. Users can quickly drill down on commands to view the frame and link layers. All of the analysis views can be used simultaneously and are automatically synchronized and displayed within one application. Statistical reports provide a wealth of statistical and performance reports on events and error counters, as well as performance metrics, providing users with a snapshot into captured traces and rapid access to items of interest. 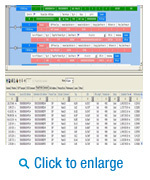 The screen shot above shows an example of a Packet View in the top half of the image and a Statistical Report in the bottom half of the image.